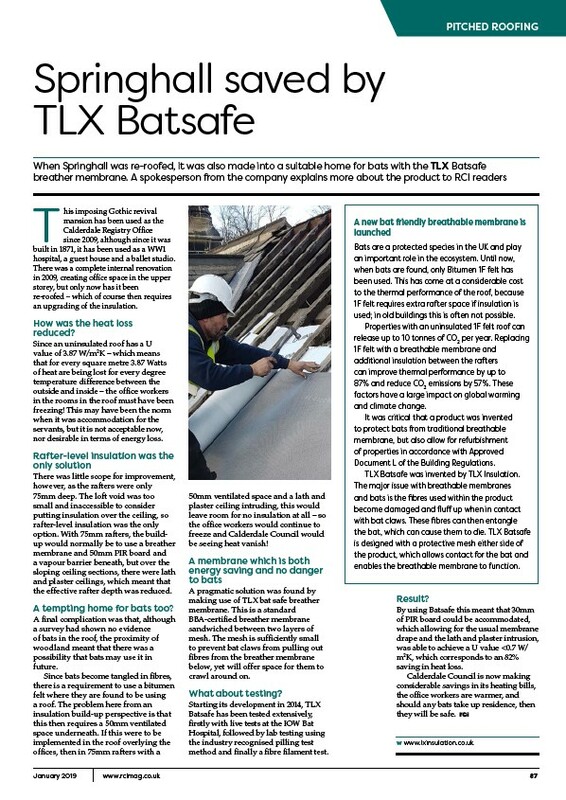 PITCHED ROOFING Springhall saved by TLX Batsafe When Springhall was re-roofed, it was also made into a suitable home for bats with the TLX Batsafe breather membrane. A spokesperson from the company explains more about the product to RCI readers This imposing Gothic revival mansion has been used as the Calderdale Registry Office since 2009, although since it was built in 1871, it has been used as a WW1 hospital, a guest house and a ballet studio. There was a complete internal renovation in 2009, creating office space in the upper storey, but only now has it been re-roofed – which of course then requires an upgrading of the insulation. How was the heat loss reduced? Since an uninsulated roof has a U value of 3.87 W/m2K – which means that for every square metre 3.87 Watts of heat are being lost for every degree temperature difference between the outside and inside – the office workers in the rooms in the roof must have been freezing! This may have been the norm when it was accommodation for the servants, but it is not acceptable now, nor desirable in terms of energy loss. Rafter-level insulation was the only solution There was little scope for improvement, however, as the rafters were only 75mm deep. The loft void was too small and inaccessible to consider putting insulation over the ceiling, so rafter-level insulation was the only option. With 75mm rafters, the buildup would normally be to use a breather membrane and 50mm PIR board and a vapour barrier beneath, but over the sloping ceiling sections, there were lath and plaster ceilings, which meant that the effective rafter depth was reduced. A tempting home for bats too? A final complication was that, although a survey had shown no evidence of bats in the roof, the proximity of woodland meant that there was a possibility that bats may use it in future. Since bats become tangled in fibres, there is a requirement to use a bitumen felt where they are found to be using a roof. The problem here from an insulation build-up perspective is that this then requires a 50mm ventilated space underneath. If this were to be implemented in the roof overlying the offices, then in 75mm rafters with a A new bat friendly breathable membrane is launched Bats are a protected species in the UK and play an important role in the ecosystem. Until now, when bats are found, only Bitumen 1F felt has been used. This has come at a considerable cost to the thermal performance of the roof, because 1F felt requires extra rafter space if insulation is used; in old buildings this is often not possible.